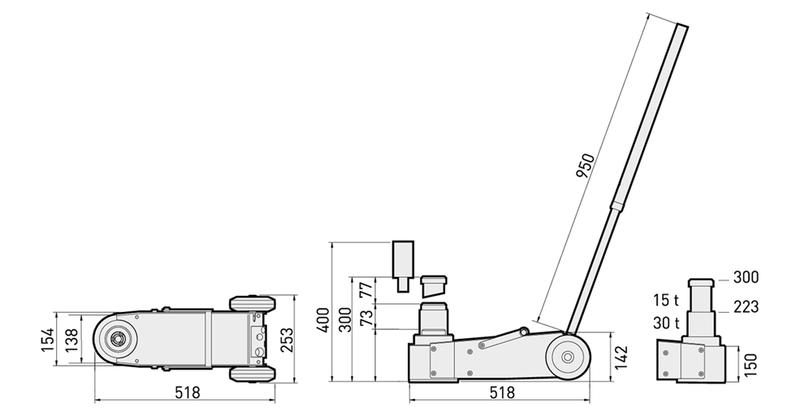 The telescopic lever has three posicions: For moving the jack and for position for working. The unique difference is that we have integrated the deposit into the frame so as to make it more compact, and to make the chassis extraordinarily robust and rigid. Without resorting to aluminium, so as not to reduce the strength of the jack and its useful life, we have achieved that the jack is an excellent weight while maintaining its exceptional load capacity for its category, 15-30t. The most compact, robust and practical model in the market.